When I was a little girl, I thought I’d really be a grown-up when I could eat soft-boiled eggs for breakfast, just like my dad. I was fascinated by the way he carefully tapped the top off with a knife, then sprinkled salt & pepper inside before scooping spoonfuls onto bites of seriously buttery toast (we are a buttery family). I only liked the whites of eggs at that stage of my life, so I was too apprehensive to tackle a whole egg for myself, but the elegance of it all definitely motivated me to learn to like the yolks, too. And oh have I learned, ha! If you cut me open I’d bleed egg yolks at this point in my life. I kind of forgot about soft-boiled eggs for awhile, lured by the sexiness of poached (it feels very impressive when you first learn to poach an egg, even though it’s the easiest thing in the world), but they are very much back in my rotation, especially during tomato season. It’s hard to imagine a more humbly glorious breakfast than slices of perfectly ripe tomato, hot buttered toast, and a soft-boiled egg or two. The addition of smoked pork (ham or bacon) would be lovely but not necessary. Bring 3 inches of water to boil in a medium saucepan. Adjust the heat so the water is at a soft rolling boil (you want a full boil, but not so hard that it knocks the eggs all around and cracks them). With a slotted spoon, lower 1 or 2 cold eggs into the pan. Set a timer for 5 minutes for very runny eggs, up to 7 minutes for a more custard-like yolk. (The egg in the picture was cooked for 5 minutes 30 seconds). When the timer goes off, use a slotted spoon to transfer eggs to a colander. 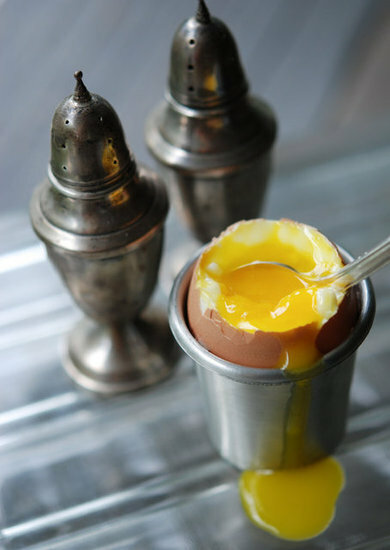 Rinse under cold water for 30 seconds, then transfer eggs to egg cups, narrow-side up. To remove the top of the egg, tap gently around the top with the back of a knife, slice into the egg part way, then lift the top the rest of the way off. Sprinkle in salt & pepper and serve immediately. 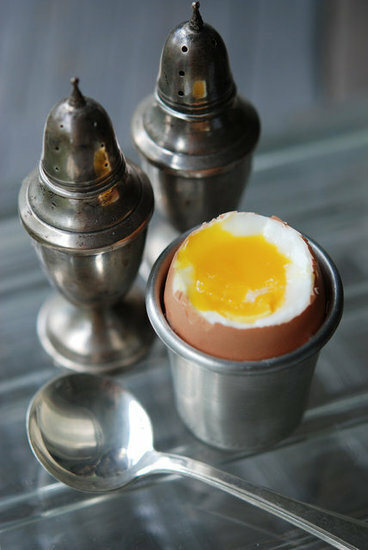 Growing up with British parents soft boiled eggs with "soldiers"( rectangular slices of buttered toast for dipping in eggs) was and still is a staple. So many egg cups they almost have their own shelf! So to is hunting down antique or new tool versions of egg scissors/snippers for cutting off the top of the egg just perfectly to avoid the tragedy of a poorly executed knife. Love a soft boiled egg for breakfast, it is a regular weekend treat for us!